The diagnose my skin rash page focuses on providing information on the types of rashes that can occur. A rash is a very common skin care problem for individuals around the world. Almost every individual has had this type of problem at some point in their life. No part of the body is immune to this problem. For example, an individual can get an entire body rash or it can be more localized. Typical target areas are: the inside of arms, underarms, leg joints, face, under breasts, shins, etc. The difficulty in trying to diagnose my skin rash is that the cause can vary substantially from person to person. In addition, a rash can be caused by a variety of sources and this makes it a challenging problem to diagnose this problem properly. When proper skin rash diagnosis is not performed, treatments and remedies are difficult to find. If you have a rash story that you would like to share with other readers of the healthy-skincare.com website in order for them to diagnose my skin rash, then please visit the diagnose my skin rash - types of rashes page. In order to properly - diagnose my skin rash type - it is important to understand the factors, which are responsible for this problem. When trying to diagnose my skin rash, viruses should be considered problematic because they are one of the main reasons why people get a rash. Viral skin rash examples include: shingles, chicken pox, and hiv. A roseola, child, or infant rash occurs in younger individuals and is also due to viruses. The effect of bacteria should also be examined when trying to diagnose my skin rash. Examples are strep, syphilis, Lyme disease, impetigo, and cellulitis infection. Fungus can cause a rash. An example is known as ringworm. More specifically, tinea pedis or athletes foot is a fungal attack on the feet. Tinea versicolor is a fungus that causes discoloration patches. When attempting to diagnose my skin rash, be aware that certain diseases can produce a rash. Lupus is one example. A stress rash or stress hives, can occur with any individual. Hives can be dealt with naturally at this hives treatment link. A heat rash on the skin are very common as well. A heat rash treatment is required when a person develops this condition after overexposure of the skin to hot and humid conditions. Miliaria, prickly heat, sun and sweat rash are also terms used to describe this type of problem. A sweat rash is characterized by the following symptoms: a red rash that is sore, inflamed, has an itchy and/or burning sensation to it, is moist, and the surface of the skin may be broken in some areas. Prickly heat is initiated by exposure to hot temperatures and humid conditions that lead to excessive sweating and blockage or inflammation of the sweat ducts. This causes sweat to be trapped under the skin and this in turn irritates the it causing a prickly rash to develop. Cold dry weather can cause a dry skin rash or xerosis. When trying to diagnose my skin rash, insect bites should be considered. Mites cause a scabies rash. 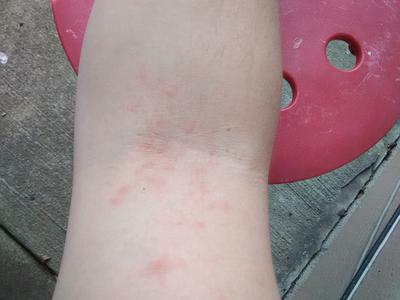 Other bug bites or insect bites or stings can also lead to a rash, either locally at the site of the bite or all over the body if an allergic reaction occurs. A bullseye rash is caused by a type of bacterium that is not found on human skin. It is transferred to humans from certain animals via ticks. A bed bug rash can occur when you have been bitten by bed bugs. 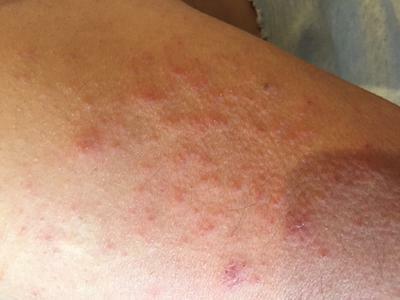 The skin condition caused by the bites appears like a number of small hives. These hives tend to be in a cluster or orderly row pattern. Plants also contribute to this problem and examining any recent contact with them can help you diagnose my skin rash. Many people have experienced the uncomfortable and very itchy feeling of a poison ivy or burning poison oak rash. An allergic rash is quite common for many people. This is because nowadays people are reacting to allergens much more than in the past. Even very small amounts or very small exposures to allergens can trigger an allergic reaction and cause this problem. Allergic reaction rashes on the skin are some of the most difficult ones to diagnose because the allergens responsible may be difficult to isolate or identify. People with food allergies commonly experience a food allergy rash when they ingest or come into contact with the problematic foods. Other types of allergies can lead to an eczema type rash. A niacin skin rash or vitamin b3 rash can develop if the individual is allergic to it or has a sensitivity to the vitamin. Basically, this problem is characterized by hives or a redness all over the body. When trying to diagnose my skin rash, be aware that drugs can produce hives or eruptions as well. People who have sensitivity to penicillin for example, often experience a penicillin rash. Other drugs such as lamictal, can produce a lamictal rash. The use of strong steriod creams on the face is thought to cause perioral dermatitis rash or rash around the mouth. Various chemicals are likely to produce rash symptoms in people. 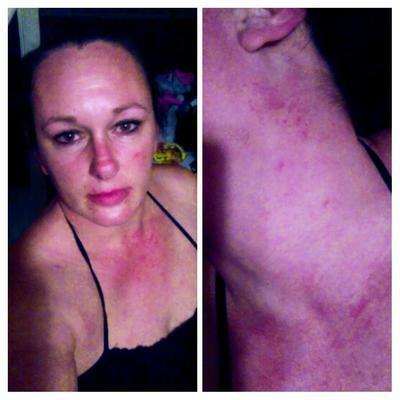 Swimming pool rash is one example. Nair rash is another. A general skin rash caused by repeated contact with chemicals is a called chemical dermatitis. The principle cause of the hot tub rash is chemicals, leading to a chemical dermatitis condition. Like swimming pools, hot tubs contain chemicals to kill bacteria and sanitize the water. Xanthoma, which is also known as xanthelasma, is a skin condition characterized by fatty growths or bumps. These growths are due to fat or lipid build-up under the surface of the skin. The growths are almost always painless and are not cancerous. Cherry Angiomas or Senile Angiomas are smooth dome like bumps on the skin that are bright cherry red to purple in appearance and can develop anywhere on the body. However, angiomas are most often found on the trunk of the body and are a quite common problem. Granuloma Annulare or GA is a chronic skin condition first described as far back as 1895 and is characterized by a rash that can be raised, bumpy, and red, purple, skin-colored, or pink. The overgrowth of keratin can lead to keratosis polaris, otherwise known as the chicken skin rash. A petechial rash is sometimes referred to as a purpuric, petechiae, or plural petechiae rash. It is basically a number of small red or purple spots in the skin. The size of the spots is on average 1 to 2mm or about one half inch or less. In addition to all the problems listed above, there are also a large number of other types of rashes where the causes are many or undetermined. Listed below are links to information on different rashes so that you can diagnose my skin rash. There are various child rashes that can occur. The causes of these are quite broad. This page briefly discusses some of the more common childhood ones. 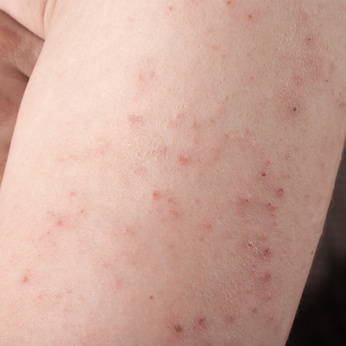 The Christmas tree rash is associated with the non-contagious condition called pityriasis rosea. Simply described, this is a dry skin type condition that has a scaly texture, is reddish pink in color, and may or may not be itchy. The psoriasis rash is one example. A diaper rash is a condition that is common in babies. It is also a skin problem that may affect adults (usually but not always the elderly) that have to wear a diaper due to bladder control problems or incontinence. Anyone that has to wear a diaper will likely develop this problem at some point during the diaper wearing period. There are many causes for a foot rash. It can be simply due to a viral source such as shingles, chicken pox, or HIV, or it may be bacterial in nature and examples of this include strep, syphilis, or cellulitis skin infection. A genital or groin rash can occur because of many reasons. Some are minor, but some of them indicate a more serious health problem. There are many causes for a leg rash. Some of the types which are likely to appear on the legs are discussed in this section. Lichen Planus or LP is a disease characterized by raised or swollen itchy skin. It usually is found on the ankles, inner part of the thighs, the forearms, but any skin area of the body can be affected such as inside the mouth, the genital area, the scalp, or the nails. The pityriasis rosea main symptoms are a dry skin that is scaly in texture and reddish-pink in color. The discoloration can range from faint pink to deep red depending on the individual and their skin pigmentation. A shaving rash can be prevented with proper shaving techniques to avoid excessive skin irritation. Some shaving tips to prevent this problem are provided. Sun poisoning, sun, photodermatitis, or solar dermatitis rash are often equated to a sunburn and essentially it is the same type of skin problem. There are several causes for an underarm or armpit rash. For example, a rash in the underarm area may be caused by an allergic reaction to the ingredients in the deodorant or antiperspirant being used. It may also simply be a chemical dermatitis condition caused by the chemicals in these products. Whenever an unexplained rash appears on the skin there is always concern and it is difficult to diagnose my skin rash. Is it just a minor ailment or is it an indication of a more serious underlying health problem? Is it viral, bacterial, fungal, or allergy based? Return to the Healthy Skin Care home page or visit the pictures of rashes page. 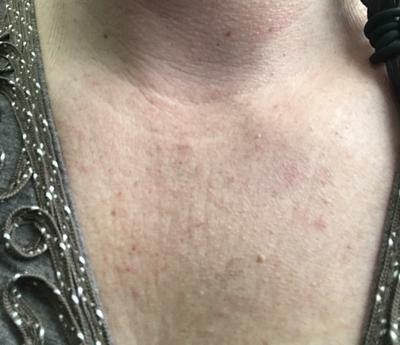 Below are reader's submissions looking for help in diagnosing their skin rash problem. 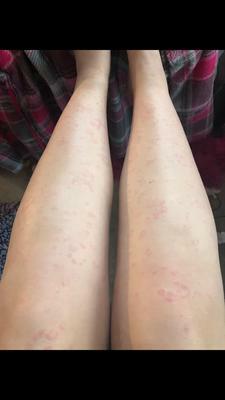 This rash is not normally itchy but sometimes something will trigger an outbreak and it is insanely itchy until I have a cold shower. I have had this rash for years and I just want to know what it is. I have a red lacy vein like rash under the skin and I cannot feel the rash upon touching it. It started on my chest went up my neck and across the cheeks and nose. I have a small dotted rash on my arm that appears every time I touch insulation and sweat. A lot this only happens on my arm and nowhere else. I am a 14 year old Caucasian female with no prior skin problems and in perfect health! I went to Nebraska for a few months back in July of 2017, and stayed in a home where the previous tenant had cats. The carpet was cleaned but still smelled like cat. 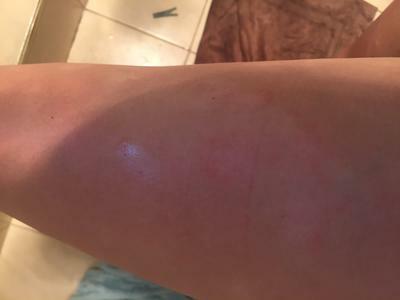 I was there for three months and when I got back to Texas I started having this red rash that at first I thought was ringworm because of the round circular, crescent shaped red rings. I also had lumps that would form under the skin on my feet, arms, and legs, that would come and go with rashes and would itch. It comes and goes weekly. I have had blood tests and stool sample tests for parasites with negative results. The dermatologist told me it is hives but if so where did it come from and what about the lumps that come and go? And why now, but never before? This itchy rash all started with a couple spots about three weeks ago on the back of my shoulder. Now it is all over my chest, back, buttocks, and arms, and only a couple spots on my legs. It is very itchy. I have been to the dermatologist and they told me it is sun damage, but I have a feeling it is something more as it seems to be getting worse. Anyone have a clue as to what it could be? I had a small rash on my foot that was located on the bottom center. The rash then moved up the sides and then moved to the other foot. I went to a podiatrist for this problem and was given a topical treatment. I then went to my regular doctor and was prescribed creams. The affected area started to blister. I then went to a dermatologist and was given more creams and then was given even stronger creams along with some oral medications. I also had biopsies performed and I had to have blood work done on a monthly basis. I was on Methotrexate for 18 months and my gums bled daily. Finally, the doctor told me it was an allergic reaction to shoe glue! It had moved to my hands as well. Seven years into it, I had laser treatments at $500 a treatment! Palmoplantar-pustular Psoriasis is what the diagnosis was and I suffered 10 years of bleeding hands and feet. Finally, Otezla saved me and I am now 100% clear! Please add a comment and indicate title of post you are commenting on.